DW Life > d i v e r s i t y w o m a n . c o m Fa l l 2 0 1 4 D I V E R S I T Y W O M A N 55 mindfulness can help us choose how we will behave, nudging (or jolting) us out of autopilot mode," said Tara Healey, program director for Mindfulness-Based Learning at Harvard Pilgrim Health Care, in a recent article in Mindful magazine. Indeed, research shows that mindfulness may shift the way our brain functions and help us improve attention, reduce stress hormones, and even bounce back faster from negative information. In her mindful leadership trainings for individuals at every level of an orga- nization, Marturano ofers a plethora of exercises to help people cultivate focus, clarity, creativity, and compassion. For example, participants learn how to rem- edy the chronic distraction that most of us are subject to in an increasingly multi- task-oriented world. (See sidebar, Take a Purposeful Pause.) "We're constantly interrupted by dings from email and texts," says Marturano. "When you come back to what you're do- ing, you can't just pick up where you left of—you need to take a few steps back. Tose few steps can add up to reduced productivity over the course of a day." When participants in her courses learn how to defect distractions and complete tasks from start to fnish without inter- ruption, they fnd they have extra time in the workday. Marturano also encourages people to take breaks periodically as a means of opening the space for creativity. "We sometimes have our best ideas in the shower because the mind gets a pause," she says. "Te creative brain needs down- time to stumble upon new associations or make connections." Stretching, walk- ing to the water cooler, spending 15 min- utes outside, and doing a mindless physi- cal activity are just some of the ways to shift into the right-brained headspace where new ideas may be born. Meditation to Support Productivity and Diversity Genentech fnds that one mindfulness practice—meditation—has a particularly positive efect on employees' ability to concentrate. Guided meditations are held every two weeks in various conference rooms at the biotech company's campus in San Francisco. A typical group includes 8 to 40 employees who follow relaxation journeys ofered by those both experi- enced in and new to meditation. "After recharging for 30 minutes, every- one feels calmer, less stressed, and better able to handle the challenges of the day," says Michelle Rohrer, vice president of U.S. regulatory afairs and a product de- velopment site head, who has sponsored the program. Te company has purchased the Head- space meditation app, which it ofers to employees for listening any time. "I put mine on today for just 10 minutes when I was worried about what I was going to do for a slide presentation," Rohrer says. "I calmed right down and said, 'It's okay, I don't need to get anxious about it, it will all come to me.' And it did!" Meditation also helps foster another cornerstone of mindfulness: compassion for oneself and others. As University of San Francisco law professor Rhonda V. Magee noted in a 2008 article recently published on the website Mindful.org, this can be particularly useful for pro- moting a healthy atmosphere around diversity. "Contemplative practice has helped me deal with the day-to-day chal- lenges of working as a black woman in a world not always prepared to treat me, my reality, or my experiences as worthy of full recognition and respect," she said. "Te practices have assisted me in main- taining consciousness of our intercon- nectedness as human beings." 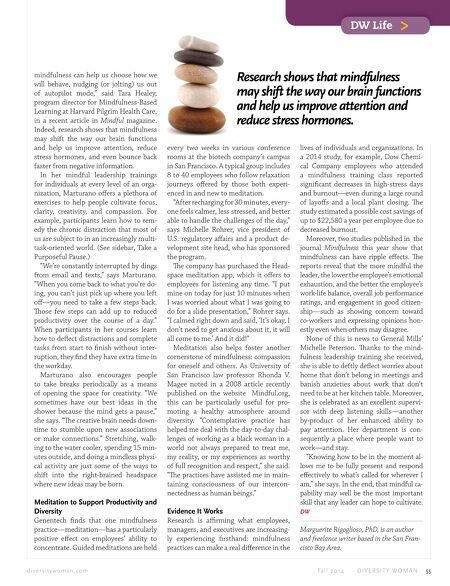 Evidence It Works Research is afrming what employees, managers, and executives are increasing- ly experiencing frsthand: mindfulness practices can make a real diference in the lives of individuals and organizations. In a 2014 study, for example, Dow Chemi- cal Company employees who attended a mindfulness training class reported signifcant decreases in high-stress days and burnout—even during a large round of layofs and a local plant closing. Te study estimated a possible cost savings of up to $22,580 a year per employee due to decreased burnout. 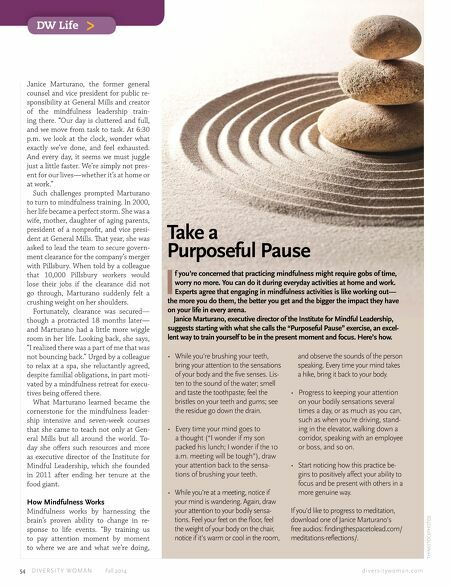 Moreover, two studies published in the journal Mindfulness this year show that mindfulness can have ripple efects. Te reports reveal that the more mindful the leader, the lower the employee's emotional exhaustion, and the better the employee's work-life balance, overall job performance ratings, and engagement in good citizen- ship—such as showing concern toward co-workers and expressing opinions hon- estly even when others may disagree. None of this is news to General Mills' Michelle Peterson. Tanks to the mind- fulness leadership training she received, she is able to deftly defect worries about home that don't belong in meetings and banish anxieties about work that don't need to be at her kitchen table. Moreover, she is celebrated as an excellent supervi- sor with deep listening skills—another by-product of her enhanced ability to pay attention. Her department is con- sequently a place where people want to work—and stay. "Knowing how to be in the moment al- lows me to be fully present and respond efectively to what's called for wherever I am," she says. In the end, that mindful ca- pability may well be the most important skill that any leader can hope to cultivate. DW Marguerite Rigoglioso, PhD, is an author and freelance writer based in the San Fran- cisco Bay Area. Research shows that mindfulness may shift the way our brain functions and help us improve attention and reduce stress hormones.